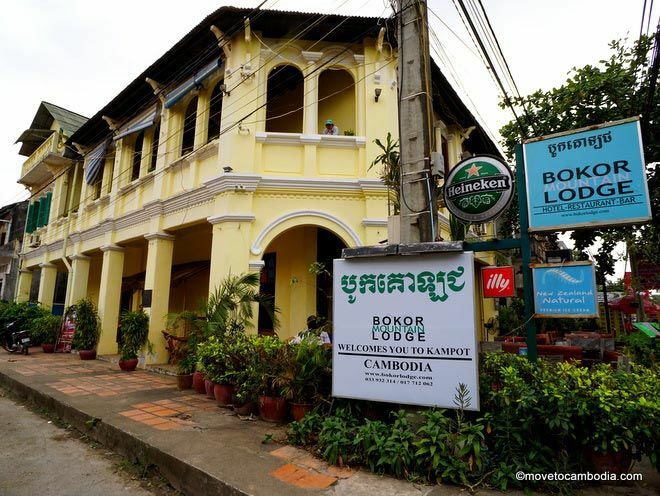 Bokor Mountain Lodge is nowhere near Bokor Mountain, nor is it a lodge; in fact, it is a very centrally located hotel in Kampot town. Bokor Mountain Lodge’s beautiful colonial facade belies the drab interior. Bokor Mountain Lodge’s yellow French colonial building looks more promising from the outside than from the inside, which is run-down and filled with curious decor, such as posters printed to look like framed photos of apsara dancers thumbtacked to the wall. In a country where decent framing can be had for next to nothing, we question why a hotel that charges $50 a night wasn’t willing to spring for actual frames for its artwork. But we digress. Inside the Bokor Mountain Lodge. Rooms are simple, with a jumble of furniture, television, and two not-quite-double-but-not-yet-twin beds. 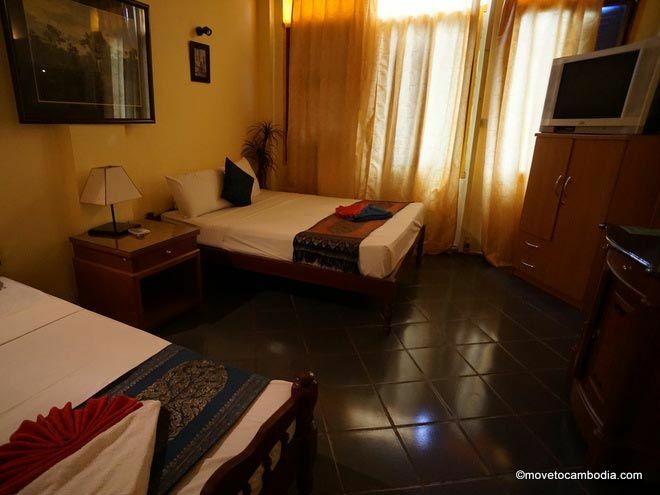 The rooms are, for the most part, shabby and guests report that they are rarely cleaned. It’s a shame, because the building itself is beautiful, but its charm is overshadowed by the interior flaws and the grossly overpriced rooms. Writing this, we realize we actually have no reason to recommend Bokor Mountain Lodge at all, because the only charming thing about it is the facade, which you can easily appreciate by walking past. Room prices range from $31 to $66 online, and are considerably higher, with no negotiation possible, for walk-ins. → Check prices and book a room at Bokor Mountain Lodge on Booking.com or Agoda now. Looking for more? View the full Kampot city guide for tips on where to stay, what to eat, and things to do.